a line in to catch "tiddlers". Launceston City Council since 1994. Rivulet is to be restored as a rich habitat. gain from an enhanced riparian zone. water catchments where they are sited. The town of Basalt, Colo.,has since 1999 been working closely with residents to reduce the number of pesticides and herbicides used to maintain the course. 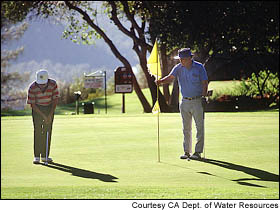 In 2000 Arnold Palmer designed a green-friendly golf course using environmentally friendly ideas. 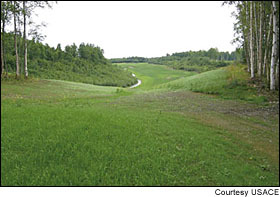 Palmer Course Design Co. designed an 18-hole championship golf course on 300 acres northwest of Arbor Day Farm. The National Arbor Day Foundation, a nonprofit education organization dedicated to tree planting and environmental stewardship, teamed up with the builder on the project. Palmer says that the project "allows them to take a proactive step to contribute sound business and environmental principles to the world of golf course design." Carol Thompson, a staff ecologist at Audubon International in Selkirk, New York,has been quoted as saying America's 16,743 golf courses cover as much acreage as the states of Delaware and Rhode Island combined. Conservationists have been concerned for years that a golf course consumes as much water as a small town and generates more pollution from fertilizers and pesticides than a farm of similar size. According to the American National Golf Foundation, a research firm in Jupiter, Florida. Some 26.4 million duffers play at least a round per year for an average fee of $36. Greens fees and equipment sales combined for $22.2 billion in 1999. The Global Anti-Golf Movement or the underground Anarchist Golfing Association, took direct action by destroying $300,000 worth of experimental genetically-altered grass for use on putting greens in June 2000,while Audubon International works to foster an environmental ethic among golf course managers. "When golf courses substantially reduce water and pesticide use and carefully incorporate wildlife habitat on the course, they should be recognized for their efforts," said Thompson. Audubon International, which is independent of the National Audubon Society, partnered with the United States Golf Association in 1991 to form the education and outreach Audubon Cooperative Sanctuary Program for Golf which today touts more than 2,300 member courses. Once member courses have completed a series of requirements that includes things such as water conservation, integrated pest management, the planting of native species, the enhancement of wildlife habitat and returning certain turf areas to nature, they are certified under the program. "Each year, more and more golf courses are eschewing the mow-all, water-all philosophy and leaving some areas as natural looking as possible," said Thompson. "British courses have been doing this for years, and the American golfer is just beginning to realize that this is good for both golf and the environment." Audubon International's Cooperative Sanctuary Program has ruffled the feathers of some environmentalists who say the organization is just using the Audubon name to garner recognition and respect for practices that amount to corporate fluff. "The industry is promoting the notion of pesticide free, environmentally-friendly or sensitive golf course," says the Global Anti-Golf Movement, an international activist organization. "No such courses exist to date, and the creation and maintenance of the 'perfect green' compromising exotic grass inevitably requires intensive use of chemicals."